As the family have returned, our little house mysteriously appears much smaller – rather like a familiar woollen jumper which in the aftermath of Christmas no longer seems quite so comfy and roomy. But it is fun to have the small person and parents back – even if there is a period round about 6pm when fun it is not. The small person is now 3 and we are all enjoying the birthday Duplo and the cache of Christmas present books. We now have a round-the-world tablescape of animal habitats (set out on a useful self heal cutting mat) which twice a day makes the perilous journey from table dining table to ottoman and back again. These multi piece play sets are all very well but we’re (well, yes, I’m) still on the look out for more basic 8 pimple bricks for making good solid buildings. Before Christmas towers of the 4 pimpled bricks and a few arches made a passable copy of Decimus Burton’s Giraffe House in London zoo (and if you caught sight of it from another perspective, there was definitely a hint of the Alhambra) but when I’m asked to help build a house, I feel held back by the lack of the right sort of materials and long for a few more ordinary bricks. Ebay is probably the answer. 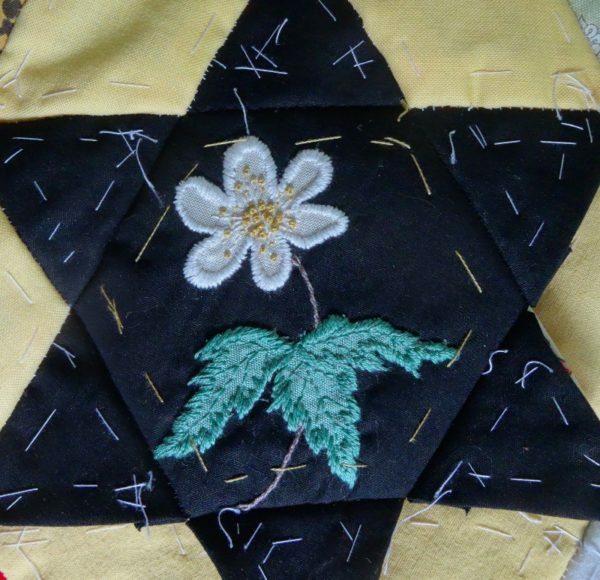 With morning nursery of nearly 3 hours – and delivery being undertaken by the parents – I have more sewing time. This week I made the little one’s Christmas present (a brushed cotton duvet cover and pillowcase in Japanese penguin fabric from Ray Stitch on the Essex Road which delight of all delights is all of 15 minutes away on foot) and I am making headway on his birthday sweater about which I feel particularly virtuous as I undid a three quarters made child’s coat with moth holes (having treated the wool first of course). More knitting is planned as it works rather well with child care. There’s a lot I don’t miss about the beech trees in the vicarage garden (no season goes by without self shedding (from leaf cases through flower fluff and culminating in uncompostable leaves) but I will miss some of the plants that carpet the floors beneath them, especially the hellebores, wood anemones and the bluebells. 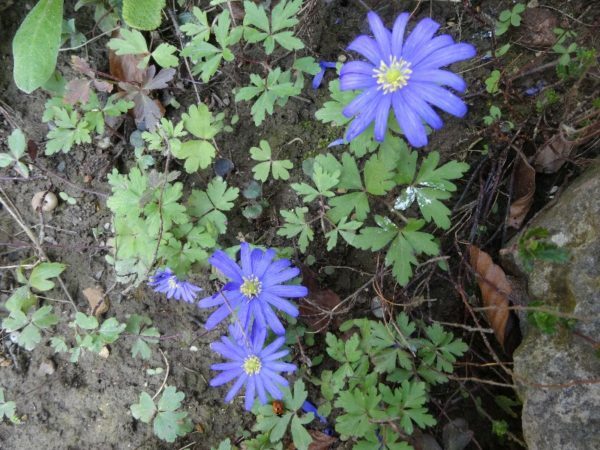 The little creamy white flowers, Anemone nemorosa (Anemone from the Greek anemos meaning wind and nemorosa “of the woodland” from Latin), are delightful and so too are less sophisticated blue Anemone blanda of which just a few appeared in the vicarge garden (see pics of my poor specimens). The nemorosa variety are interesting for being slow spreading (6 ft in 100 years) so extensive coverage is a good indicator of ancient woodland. As suburban London spread outwards in the last hundred plus years, little pockets of old woodland survived and it is here that the wood anemone often flourishes. Appropriately the wood anemone is the flower of Middlesex and just as the county itself is now almost invisible, so too do you have to look hard for the best expression of the county flower – beneath the trees in a beech wood is a good place to start. Interesting article from The Telegraph by Sarah Raven on these flowers here. I hadn’t thought about the detritus of beech. There’s a beech hedge between my parents’ house and their neightbours’ garden, but it’s kept strictly limited, so can’t overwhelm. And the bright green in the Spring is worth a bit of tidying! Beech in hedge form behaves quite differently from mature trees apparently and doesn’t shed leaves in winter. My parents too went in for a beech hedge for just that reason. I’ve been reading a lot of Richard Mabey recently and came upon this difference between hedge and tree somewhere, but of course I can’t for the life of me find it now I want to – when I do I’ll let you know. The young leaves of the mature trees are also utterly lovely (a bright lime green) in spring when first they appear but later the canopy is so darkly dense little light gets through. Oh I am so glad I checked you! 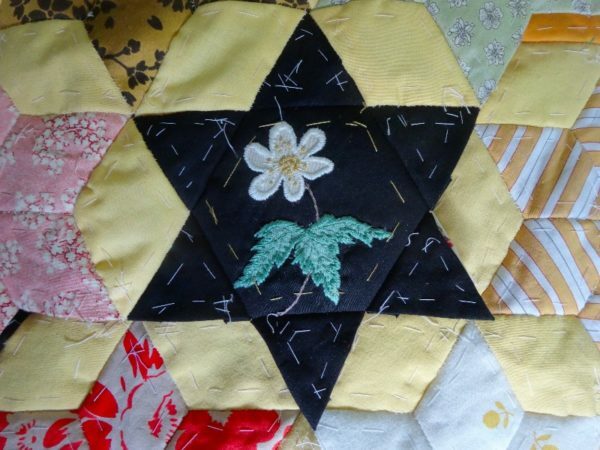 Love to see your posts of sewing and nature and family are back. Thanks for saying this Amara – your interest is much appreciated. So lovely to read your latest blogs, Mary. I’m also very happy to read that you are settled in to your new home and that, family overcrowding notwithstanding, you are beginning to settle in! Lovely to hear from you again, Sally – it’s very kind of you to say you still enjoy the blog. 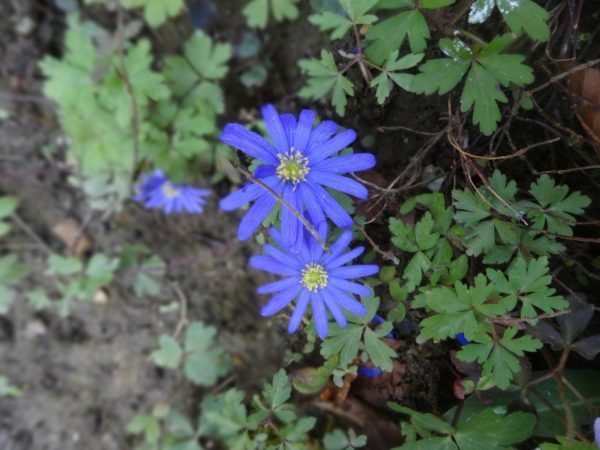 Glad to hear the little anemone brought back memories of your mother. Perhaps your soil is different – Jacksdale is on the edge of the Peak district isn’t it? Perhaps you’ll have to try growing it in a pot. Glad to hear you enjoy the blog and thank you very much for letting me know, Nanny June.